The Granite Gurus: FAQ Friday: Does Glass/ Marble Tile Backsplash Go with Kashmire White Granite? 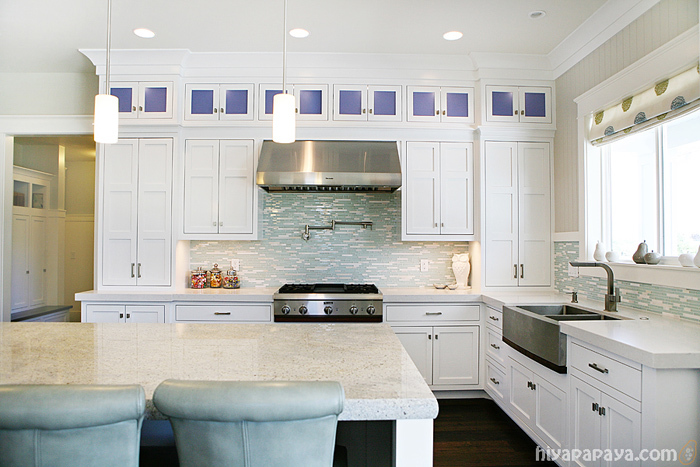 FAQ Friday: Does Glass/ Marble Tile Backsplash Go with Kashmire White Granite? "I'm having a design quandary. We've just started building a house and I'm trying to figure out what I'm wanting to do for our countertops, etc. I'm thinking I want to do Kashmir white granite for the countertops (or something similar) and my question is: Would a glass/marble tile backsplash look good? Or would it be a bad thing to mix the two stones together? I just can't picture it. If you have any advice or suggestions I'd love some!" Thanks for the question Candace! I definitely think you can make the glass/ marble tile work with a granite countertop like Kashmire White. You just need to make sure the tile you select isn't too busy. You don't want it to fight with the pattern in the granite. I'd recommend using a larger tile than 1"x1" square. Just because they can get a little busy. Look for linear tiles (like the photos below) or a larger square or subway tile. The larger the tile, the less busy it looks. Then just make sure the colors work well together. You don't need the tile colors to match the granite colors exactly, mainly you are just making sure the color tone is correct. This home was built by one of our favorite builders to work with, Millhaven Homes, and was actually just in the Utah Valley Parade of Homes last month. They used Kashmire White granite on the island and Misty Carrera CaesarStone on the perimeter countertops. 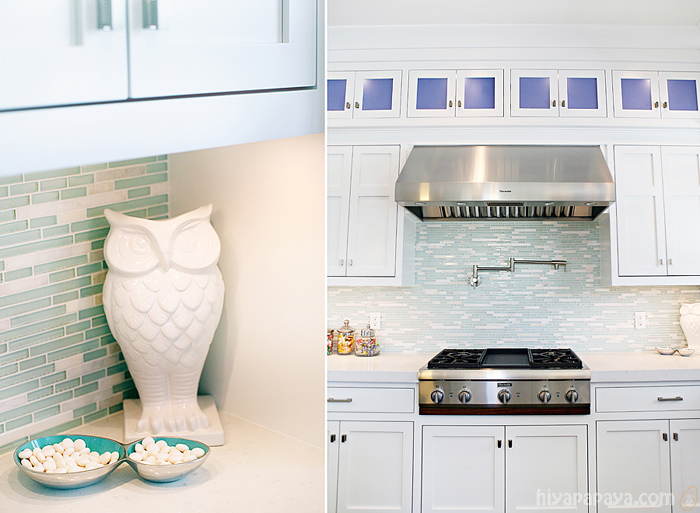 The backsplash is a glass/ marble linear tile. As you can see, the tile works so well with this granite. They don't fight with each other and the granite is quiet enough to let the backsplash tile shine. Photo: hiya papaya. Countertops by MGS by Design. The edge detail on the island is a 2 1/2" Half Moon and the edge detail on the perimeter counters is the 2 1/2" Miter. I'll be showing more pictures of this beautiful home soon! Do you have a design or stone question you'd like to see answered here? Send me (Steph) an email!